Covering the everyday and the esoteric, could this pedal meet all your reverb needs? Once upon a time, reverb came in just a few flavours, typically a spring, a plate, or maybe the acoustics of a large physical space — and digital reverb units were all about emulating those things. While the first such processors weren’t entirely successful in emulating these acoustic and mechanical reverberations they offered a distinctive sound of their own which quickly became part of our musical history. The possibilities that digital processing opened up soon meant that reverb was not only about creating believable spaces but became elevated to the status of ‘special effect’ — lots of deliberately unnatural variants started to become popular, such as infinite reverb, reverse reverb, reverb with modulation, and pitch‑shifted ’shimmer’ reverb. Today’s stompbox market already caters for more adventurous reverb tastes with devices such as Eventide’s H9 and Black Hole, Strymon’s Big Sky, the Source Audio Ventris and the more affordable (but mono‑only) Electro‑Harmonix Oceans 11 — and that’s just scratching the surface! 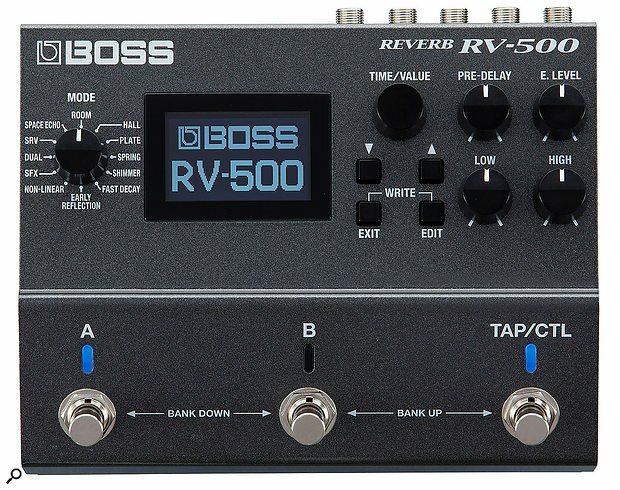 Boss might not be the first name to spring to mind if you were seeking a really esoteric reverb, but the new Boss RV‑500 not only bears comparison with its aforementioned rivals in terms of sound quality and effect variety, but it also offers a number of useful functions that most of its rivals can’t. Like the Source Audio Ventris, the RV‑500 has a dual‑engine A/B mode, allowing two reverbs to run simultaneously (with routing options that also include a frequency‑split mode with a choice of crossover frequencies), plus there’s the ability to add a digital delay in either series or parallel to each reverb patch — and the delay stage includes modulation and EQ. A ducker is also available for every preset, which is a nice, practical touch. The RV‑500 also offers detailed emulations of two classic Roland products that date back to the 1970s and 1980s, specifically the venerable RE‑201 Space Echo, complete with switchable head combinations, and the SRV‑2000 Digital Reverb. The RV‑500 uses 32‑bit A‑D/D‑A converters, employs 32‑bit/96kHz floating‑point processing, and can accommodate mono or stereo inputs and outputs. It has MIDI I/O, for integration into more complex systems, an external footswitch/expression jack, and a USB port for use with the free RV‑500 Editor/Librarian software and firmware updates. (It’s compatible with both Mac OS and Windows‑based systems.) Up to 297 patch memories are available, which is probably around 290 more than I’d need for a typical gig! The Tap/Ctl footswitch can be used to tap in a tempo in real time, but it can also be assigned (per patch) to access other functions, such as infinite reverb. There’s the option of true or buffered bypass, and a user‑selected ‘carryover’ function (per patch) allows reverb tails to die away naturally rather than cutting off abruptly when changing patches or operating bypass. 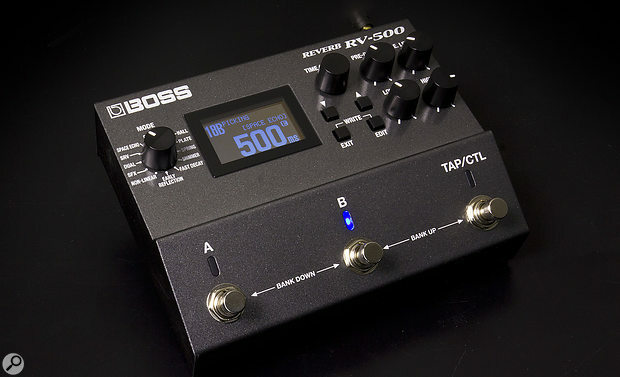 Furthermore, the RV‑500 can be powered from four AA‑size batteries (supplied), with a running time of a little over four hours, but as with most such pedals it’s recommended to run it from an external power supply (not supplied), in this case a 9V one that’s capable of delivering 280mA or more. After using the pedal in the studio for a few days I have nothing but praise for the sounds, but it does seem a bit tight not to include a suitable power supply as standard, given that the pedal that can barely manage an evening on a set of batteries! The RV‑500 is designed for floor use and is housed in a tough steel case. Its three footswitches are sited well away from the other controls, and from the back‑lit LCD that doubles as a patch name and parameter readout. The panel controls look deceptively simple — there are just five knobs (Time/Value is an encoder with a push switch), four buttons and the rotary reverb Mode selector, but they allow full editing access via a logical, hierarchical menu, as well as direct access to the most useful parameters: Time/Value, Pre‑delay, FX Level, Low EQ and High EQ. Two of the buttons function as Up/Down cursor controls and pressing Exit and Edit together writes the current settings. A rotary switch accesses the 12 main reverb modes but behind the scenes there are actually 21 reverb types with comprehensive but not over‑fiddly editing facilities accessible both from the front panel or via the software. If you have a computer to hand, I’d recommend downloading the free editing software, as it makes the process of tweaking or creating patches much faster. The RV‑500 offers mono/stereo I/O as well as CV/expression pedal and MIDI control. Deeper parameters for the reverbs include both pre‑ and post‑ducking values and there’s also what Boss call a ‘Virtual Expression Pedal’ — which, essentially, is an internal modulation feature that can either ramp to a target parameter value when triggered or apply a cyclic waveform to a parameter, LFO‑style. Using this, or a physical external pedal, dynamic modulation can be added to the reverbs — or some other parameter, such as delay feedback or reverb EQ, can be changed. The footswitches, which have blue/red LED indicators above them, switch banks when pressed in pairs, and are also used to access the A and B patches within each bank. 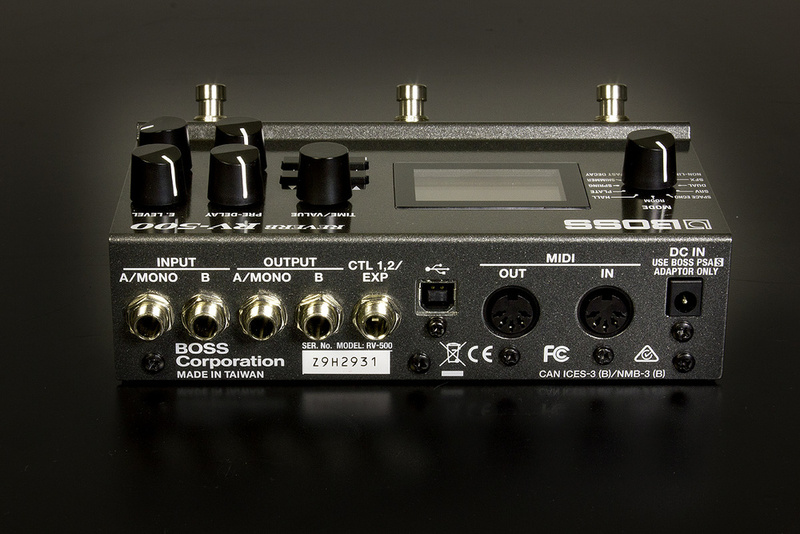 They can also be reconfigured to allow direct access to three stored reverb patches or other user‑defined functions. Tap is normally used to set tempo or to activate another function as set up in the current patch. How the two patches in a dual preset work together can be set up in Simul Mode. The options are Series or Parallel, with the sound either mixed or sent separately to the two output jacks. Alternatively, the two inputs can be split, with one reverb applied to each and output in mono from the corresponding output jack. The signal can also be split into two frequency bands, with a different reverb effect applied to each. But enough of the feature set — just what effects can you expect from the RV‑500, and how do they sound? All the more commonplace reverb types are catered for by the Room, Hall, Plate and Spring modes, and most of these have sub‑options such as room size or number of springs. All four are available in Dual mode, though the other types are excluded. There are also four types of dedicated Early Reflections, a Nonlinear reverb for creating gated or reverse effects, the Dual mode for combining two reverbs, plus the SRV reverb and Space Echo emulations. Then there’s the ubiquitous Shimmer effect, which can add two different reverb pitches (up to ±24 semitones, not just octaves), a special Fast Decay reverb and an SFX section that offers a choice of Lo‑Fi, Slowverb or Storm. Storm? The manual says ‘Sound that appears to be tossed by a storm.’ Well, I guess that clears that up then! The quality of the reverb sounds is truly first class. The old SRV has a nice vintage character. Spring sounds suitably metallic and fluttery if surf music is your thing. But what really shines through is the ambient reverb capability, which could go head‑to‑head with any of the more esoteric reverb pedals out there. Slowverb combines an adjustable slow attack with the option of octave‑shifted reverb to create a smooth, shimmery (or deep and doomy) kind of pad sound following the note while Shimmer itself can add two frequencies, adjustable in semitones and cents, as exemplified in the Cathedral setting, which takes on the character of an organ played in a cavernous space. While pitch shifting is still an imperfect science, the shimmer effect sounds creditably smooth. Lo‑Fi produces a nice warm wash while Storm achieves what it claims using pitch‑shifting to modulate what sounds like an FM‑modulated reverb tail — it creates the sound of howling wind. And remember that you can add digital delay in series or parallel with any of the reverb effects and also add ducking where desirable. If you need only delay, then the Space Echo emulation replicates all the head combinations of the original and delivers a suitably ‘smeary’ analogue vibe — but even that choice includes added reverb. Though editing from the front panel can be a bit long‑winded on a product as flexible as this one, the presets that come with the RV‑500 cover pretty much every effect type, so the chances are that you’ll be able to get what you need by modifying them rather than starting from scratch. The menu system is also set out very logically, though not having a master wet/dry mix control is unusual; there are separate effects‑level and direct‑level settings. If you use the free software, editing becomes much simpler, largely because all the key editing parameters are visible on the same screen. All you need do is download the drivers and any necessary firmware updates from the Roland web site and you’re good to go. As pointed out earlier, only the four basic reverb types can be used in dual mode — presumably they hog less in the way of DSP power than the others — but this means that the reverb tail carry‑over function still works when you’re in dual mode. The RV‑500 delivers smooth, studio‑quality reverb and has many possible applications in the studio and on stage. Its MIDI implementation also allows it to work in larger MIDI‑controlled systems. Whether or not you need one depends on the style of music you play — if you require different reverb types for different songs, and maybe the odd tape delay effect, it will do the job splendidly, whereas if you just need a hint of spring or plate now and then, it will do the job but could be considered overkill. On the other hand, if you work in EDM, ambient, chill, lounge or cinematic musical genres, it has a huge amount to offer. Just DI an electric or electro‑acoustic guitar and you can get a host of excellent sounds right off the bat, all with stereo effects. It also works well with synths and electric pianos; I’ve even created some fun effects using bass guitar. 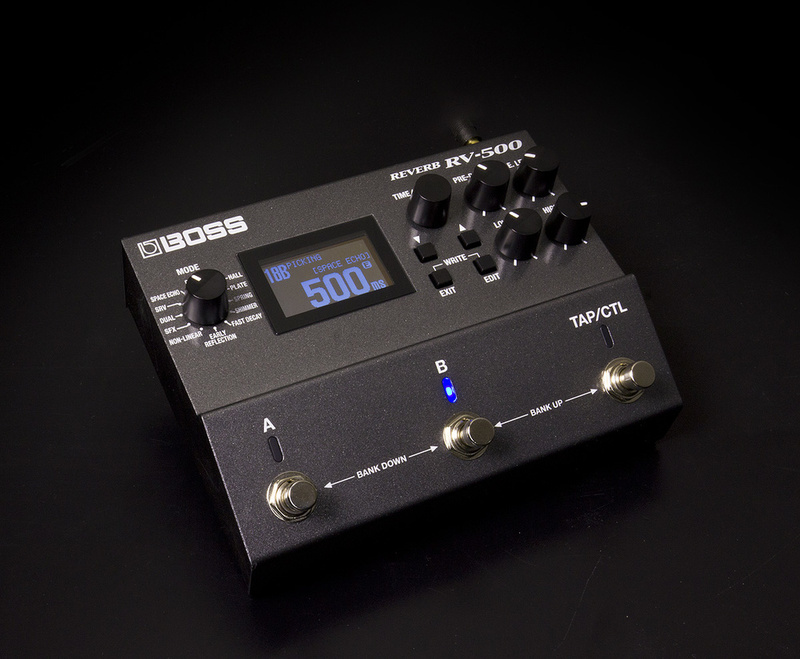 So, if you’re in the market for a high‑end reverb pedal that is generous on the extras, don’t make up your mind until you’ve tried the RV‑500. If the RV‑500 piques your interest, you might also want to check out Eventide’s H9 and Black Hole, Strymon’s Blue Sky and Big Sky, Source Audio’s Ventris and the more affordable Electro‑Harmonix Oceans 11. Smooth reverbs with dual reverb mode. Good range of speciality reverbs. Delay and ducker always available. Roland Space Echo and SRV reverb emulations included. The RV-500 is an impressive stereo reverb that is at home on stage or in the studio. The Shimmer and Slowverb effects are particularly well-suited to ambient musical styles. The review unit was loaded with firmware v1.02.